Small winding alleys and pretty villas and mansions on a slope. 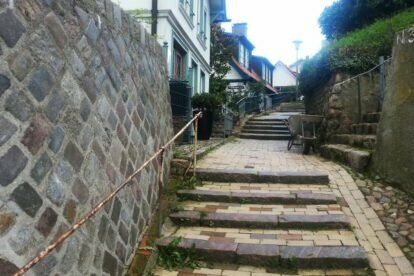 Directly at the Elbe river is Blankenese, one of the most expensive and beautiful districts of Hamburg. The houses are often white colored and it’s up and down hill all the time. Imagine how people will get the grocery stuff home… phew! Altogether 88 meters above sea level you have a fantastic view all the time over Elbe river and to the other side Finkenwerder (where Airbus has its center) and small islands in the middle of the river. Also worth a walk is the Lighthouse I recommended in another article (check the Leuchtturm Unterfeuer article). After a long up and down walk you’ll really feel like a mountain climber. Try out one of the small buses which are lovingly called Bergziegen (“mountain goats“) and only in use in Blankenese. For the cycling freaks under us: try out the Waseberg (also called “Elb d’Huez”) which is one of the toughest climbs in North Germany. As you can see: a mediterranean vibe in Hamburg is possible!